I would give you 10 stars if I could. Wonderful seller. Great product! Works great! Super fast shipping! Awesome job! The appliance arrived in good condition and has performed very well. Seems to be working great so far. I am pleased. Dealer sent it quickly, product was as described. 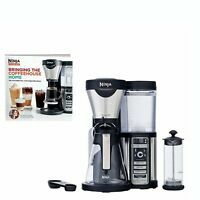 This is my first coffee maker so I did not know what to expect, this product is easy to use and easy to keep clean, my only wish would be it to have a hot plate to keep coffee warm. Whether light or dark roast, you can adjust this brew machine to make your beverage any way you like it. I had the best cup of iced coffee ever made in my own kitchen. Read the book to understand your new machine. 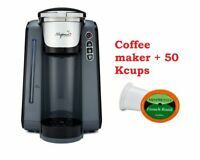 It brews only 8 cups but that is to keep your coffee hot and at its optimum flavor. Enjoying this product. The price is right for a "certified" refurbished unit. The only thing that doesn't work is the light to indicate when you are in the half-carafe brew size mode. The switch points to it so it's no big deal as it's the one setting I use the most. 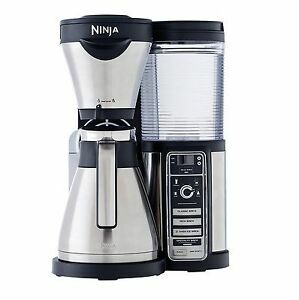 Coffee on a whole new Level ...Ninja Style! Completely thrilled to have purchased this amazing brew master! Especially when your use to brewing coffee with basic coffee makers. I highly recommend this product to everyone you will not be disappointed. Coffee never tasted better with it's extraction process your beans will explode with it's true notes of flavor. Easy to use, Easy to clean, and brews within a minute or less. The drip leg closure makes it nice too for less mess.Having the options too of travel size mug, cup, half carafe or full if your a heavy coffee drinker or have company over. Maintenance is easy too however make sure you use water with some minerals as it can over time deteriorate the parts. We love our Ninja. Many brewing options and easy to use. Very happy with our choice.